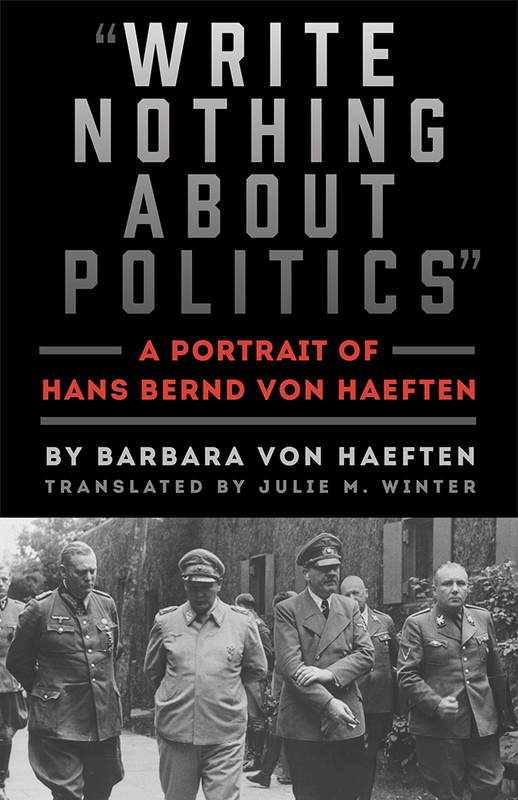 Book | MSU Press | "Write Nothing about Politics"
Barbara von Haeften’s memoir provides us with a moving account of the life of her husband Hans Bernd von Haeften, a lawyer, diplomat, and member of the Kreisau Circle resistance group in Nazi Germany. The Kreisau Circle participated in the assassination attempt of Hitler on July 20, 1944, carried out by Claus von Stauffenberg and Werner von Haeften, Hans’s brother. The Circle had also developed extensive plans for a new government to be put into place after the removal of Hitler. Drawing on personal letters and clear memories, this biography describes the life and political activity of an extraordinary man who was executed in the struggle to save Germany from the disastrous consequences of Hitler’s regime, and it sheds light on Barbara von Haeften’s knowledge of and participation in the resistance movement. BARBARA VON HAEFTEN (1908–2006), born in Duisburg, Germany, was married to Hans Bernd von Haeften and stood closely by his side as he participated in the movement that attempted to bring down Hitler and introduce a new system of government in Germany. Barbara was arrested and spent several months in jail after her husband's arrest and execution by the Nazis in 1944. JULIE M. WINTER is a Visiting Assistant Professor of German at Western Washington University. She is the translator of Freya von Moltke's Memories of Kreisau and the German Resistance, Marion Yorck von Wartenburg's The Power of Solitude: My Life in the German Resistance, and Alena Wagnerová's In 1945 They Were Children: Flight and Expulsion in the Life of a Generation. DAVID CLAY LARGE, Senior Fellow, Institute of European Studies, U.C. Berkeley, and editor of Contending with Hitler: Varieties of German Resistance in the Third Reich.